"A discussion of altruism, drawing on different disiplinary perspectives, could hardly be more timely, and this book is a thoughtful and insightful contribution to the debate." Ruth Chadwick - Distinguished Research Professor and Director, Cardiff University What motivates us to be altruistic? How did an altruistic trait evolve in humans, given that evolutionary theory assumes we are self-interested? What sorts of people are altruistic and in what circumstances? Is the welfare state a channel for altruism or does it crowd out people's altruistic motivations? This accessible book is the first introduction to the idea of altruism. It explores how we have come to be altruistic, and considers why it is important to remain altruistic, not just for the sake of others, but in order maintain the fragile fabric of human society. 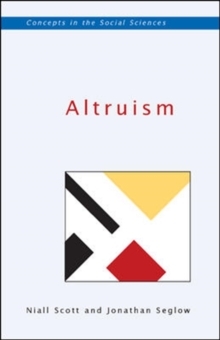 The book surveys the history of the concept of altruism and examines it from a variety of disciplinary perspectives, including moral philosophy, evolutionary biology, psychology, economics and political science. It then attempts to bring together the distinct issues and concerns of these disciplines to arrive at a unified understanding of altruism. The rational self-interested individual of economics is compared with the altruist who exhibits the virtues of empathy, compassion and benevolence. The book also discusses heroic altruism, such as that displayed by rescuers of Jews in Nazi-occupied Europe, and psychological experiments which seek to identify the altruistic trait. Scott and Seglow argue that altruism is easily extinguished and hard to nourish, but vital for a fundamentally human future. Academics and students in social sciences and philosophy will find Altruism of great interest. So too will professionals in the voluntary and charitable sectors and journalists involved in communicating social scientific and philosophical ideas to the public.